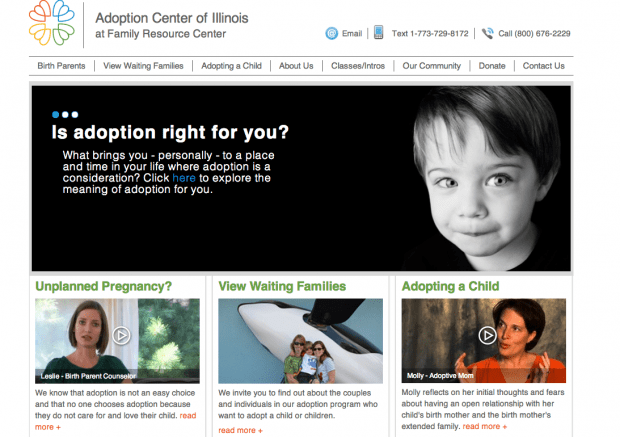 It was recently my privilege and pleasure to spend several months consulting at Adoption Center of Illinois. I was brought in to help rebrand the organization and set up a modest infrastructure for marketing and outreach. During my days in their cozy, folksy office space, I was totally immersed in the process of finding loving homes for children. To my good fortune, this included sharing many cups of coffee with ACI Executive Director Richard Pearlman, a visionary leader with genuine empathy for all members of the adoption triad (birth parents, adoptive parents and adoptees). Ask anyone who knows him and they’ll concur, time spent with Richard feels a lot like group therapy. There’s some talking, a lot of listening and many a tear shed as he shares both heart-warming and heart-wrenching accounts of lives that have been touched by adoption. My self-appointed guide to all things adoption was incredibly generous with his time and I soon came to a level of understanding that would serve me well in my efforts to bring the agency into the digital age. Casual discussions about web sliders or type fonts would quickly turn into lessons about the human experience, open communication, decision-making, grief, loss and how these dynamics impact families, employees, governments and society at large. Wow. I was a long way from the client meeting where I played the part of a cheese tortellini. Slowly, I began to see my career fueled by sociology instead of the economy and if felt good. It is only now, as I draft this post, that I realize the power of Richard’s counsel and that of other ACI staff and board members. Those many months spent helping children through adoption served as a time of career rebirth and renewal for me. It was a pause in the action, a quiet effort that awakened my inner Oprah. I now see that marketing isn’t always all about catchy and clever and breakthrough. There are times when it can be, and should be, compassionate, human and real. I will hold onto this lesson wherever my career takes me. Hopefully for many years to come.